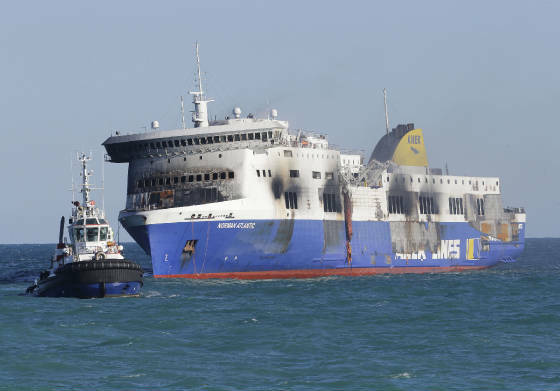 The Italian car and passenger ferry Norman Atlantic caught fire and burned during a routine voyage in the Adriatic Sea, from Patras, Greece, to Ancona, Italy, during the early morning hours of December 28, 2014. At least 12 passengers out of an estimated 500 passengers and crew members were believed to have perished. An exact count of the passengers and the dead was difficult because not all of the passengers were listed on the ship’s manifest, naval officials said. It was believed that the ship was carrying a number of immigrants illegally attempting to reach Italy. The 610-foot-long ferry, under command of Captain Argilio Giacomazzi, had just left the port of Igoumenitsa, Greece, and was steaming north in the Strait of Otranto, off the Island of Corfu in stormy weather, when fire was discovered on the lower car deck. One witness said he saw some Afghan immigrants, who boarded the ship concealed in a truck, light a fire in the ship’s garage to keep themselves warm. The flames quickly spread out of control through the ferry because it was discovered that mussels had clogged the water intake pipes to the ship’s fire sprinkler system. Several truckers, who chose to sleep in their rigs on the car deck rather than choose a cabin bunk in the upper decks, were thought to have been killed by the fire, as were numerous stow-a-ways hiding in some of the trucks. Even though he remained with his burning ship throughout a rescue operation that continued for several hours, Captain Giacomazzi fell under criticism because of the chaos that prevailed among the passengers, as they fought one another for places on buckets lowered by helicopters flying overhead. Passengers later complained that no alarm was sounded and the ship’s crew did little to assist in the rescue operation. As heat from the fire below was melting their shoes, and the passengers struggling on an open deck against gale-force winds and lashing rain, as they struggled for a chance to escape the fire. Helicopters, nearby ships and several fire-fighting tug boats assisted in a dramatic rescue operation. One large lifeboat was successfully launched even though the ship’s lifeboats were located on the lower deck and subsequently burned. In spite of all of the obstacles, most of the passengers were miraculously removed. Tragically, two crewmembers of the Albanian tug Iliria were killed with a cable snapped during salvage operations the following day. The still-smoldering ferry was towed to the port of Brindisi, Italy. It burned in port for another two weeks before investigators were able to begin inspecting the vessel. The ferry was relatively new, having been launched and put in service in 2009. It operated under an Italian flag as the Akeman Street until 2011, then was sold and given the name Scintu. Just weeks before the fire, the vessel was purchased by the ferry company Visemar di Navigazione and given the name Norman Atlantic. It was leased by the ANEK Lines at the time it burned.